More on Water and Electro-Pollution. It's just what we've all suspected - pure, "straight from the mountains" bottled water is not so pure after all. Recently, EWG released an industry-rattling report that reveals the dirty truth about bottled water. Although this is a study done in the USA, do we really think the industry here is much different? 10 brands were tested the samples showed an alarming array of contaminants, including cancer-causing byproducts of chlorination, fertiliser residue, industrial solvents and even caffeine. • Drink filtered tap water instead of bottled or unfiltered tap water. • Mix infant formula with filtered, non-fluoridated water. • Carry water in safe, reusable containers. Taipei, Oct. 7 (CNA) A civic group urged the government Tuesday to take action to dissuade children and teenagers from using mobile phones out of concern over possible electro-magnetic radiation hazards. To back its appeal, the Taiwan Electromagnetic Radiation Hazard Protection and Control Association (TEPCA) presented results of a survey on Taiwanese children and teenagers' use of cellular phones and tests on the levels of electromagnetic radiation among mobile phones marketed in Taiwan. The survey, conducted between August and October among children and teenagers aged between 6 and 18 around Taiwan, showed that 34.4 percent of polled elementary school students, 67 percent of surveyed junior high school students, and 89.6 percent of surveyed senior high school students are cell phone users. Based on the survey, the association estimated that around 2.2 million Taiwanese children and teenagers in the 6-18 age group possess mobile phones. It also concluded that the older the young people are, the longer they talk on the phone, and that 390,000 of them speak on the phone for an average of at least five minutes per call and 170,000 people talk for over 10 minutes per call. Meanwhile, tests on the electromagnetic radiation levels of 33 types of mobile phones currently marketed in the country showed that more than 60 percent of the handsets release electromagnetic radiation 1 million times higher than the background level. The association said that although cell phones have become a necessary device in modern life, industrial countries, including Britain, Germany, France, Belgium, Italy and Russia, have all advised children, teenagers and pregnant women, to refrain from using cell phones out of health concerns. The TEPCA is a non-profit organisation committed to bringing together the victims of electromagnetic radiation hazards, self-relief organisations, non-governmental organisations, individuals and groups aware of the risk to promote electromagnetic radiation hazard protection and related legislation. In the meantime .......whats happening in NZ to keep our people safe? You guessed it........"she'll be right mate"
The stats keep on proving it and the studies keep on telling us we need to wake up - ELECTRO-STRESS is a health issue. And remember we have products available that can go a long way towards protecting you from any unwanted electro-stress, simply click here. Just so you don't think I am a little over the top with my concern relating to Electrostress, I was going to suggest you have a look at what Dr Carlo has to say. Dr Carlo was employed by the telecommunication industry to carry out extensive testing to prove that there was no need to be alarmed about emf's - guess what he discovered? That's it, he discovered there were significant concerns and the companies who spent the millions of dollars on research dispute his findings. And another surprise - I have just tried to access one of the websites that features aspects of his work and ...... you guessed it, its mysteriously been shutdown! Here is a link that explains some of his work Dr Carlo's research or you could do a search for Dr G Carlo, you will find interviews on Youtube for example, happy hunting. As we have now all sprung into Spring, how are you feeling? Ready to have a great Summer? Feeling like your body can handle anything? If you didn't answer these questions with a resounding YES, then maybe its time for a little "cleaning up". Detoxification is something our body does 24/7 and we mostly take it for granted. Most of us would benefit greatly if we did a simple detox on at least on an annual basis. The sad reality is that for the vast majority of us, the additional burden our body must deal with in our fast paced, chemical laden lifestyle is overwhelming to the normal detoxification pathways of the body and this results in many problems. Just about any disease can be aggravated by exposure to toxins, some symptoms and diseases however are strongly related to toxins and suggest a greater need for detoxification. 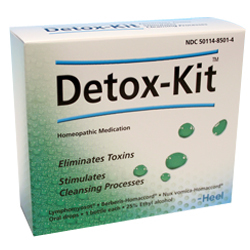 As you will all be aware, detoxification can be done in different ways, using different types of support or products. There are herbal products for bowel cleansing and liver detoxing, there are various nutrients that are important in supporting different detox organs and activities and there are homoeopathic formula that can assist the process. We have found over the years that for most people, a truly effective detox may take between 3 weeks to 3 months to be. As for these 3 day wonder detox systems, you can usually forget them, it just won't do it! "Rome wasn't built in a day". One of our most popular products in this area has been the Heel Detox Kit. This is a combination of 3 potent Biological Medicines that support all of the detox pathways and is popular because it is easy to use and highly effective. Have a look at it here, Heel detox Kit. For some it may be necessary to do the full process of weeding, feeding and seeding. This may take a little more working through but will ultimately set a person up for vibrant health and vitality. The important next step is ongoing maintenance. detoxifying your environment - this includes healthy food choices, clearing out your dangerous personal care products such as aluminium laden antiperspirants and solvent based hairspray, along with using natural cleaning products in the home etc. If you would like some help determining where you should start with having the best Summer of your life, let us know. This information reminds me of some simple guidelines that I was made aware of when studying to be come a Building Biologist. I was preparing an article on the effects of radiation. Radiation became a tool for medicine about a century ago - crude X-rays were used to give a unique look at the body and importantly the skeleton. There was NO experience with X-rays prior to this and so safety standards were not an issue - until practitioners and those working with X-ray equipment started to become ill. It was realised that there was a limit to the amount of this energy we should be exposed to. As the data continued to accumulate over time, the accepted safe level of exposure continued to drop. It eventually came to the point where we now understand that NO additional exposure to X-rays(radiation) is safe, our body gets all it needs and all it can handle from the natural environment. send it freight free and include free the handy Metagenics Guide to Detox. This small booklet includes general guidelines along with a 14 day meal planner and recipes. Sent direct to you for the total of only $85 - save up to $12.50 and get ready for a great Summer! If you would like to take advantage of this months offer please replyClick here without delay. As always, let us know if there is something special you are in need of to help keep you(or shift you onto) the path to vibrant health.